the Hong Kong Avenue of Stars! 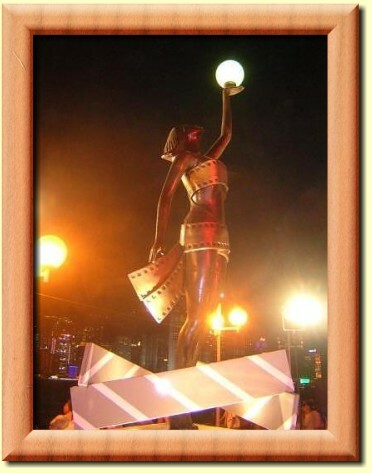 The Hong Kong Avenue of Stars is situated in Tsim Sha Tsui promenade, one of Hong Kong's latest attraction celebrating its reputation as the Hollywood of the East. Opened on April 27, 2004 for the main purpose of Building on the popularity of Hong Kong movies. The Avenue of Stars will add further appeal to our uniquely spectacular harbour by offering visitors a glittering experience of the glamorous galaxy of stars. Plus, you will also be able to enjoy the nightly show that stars at 8:00pm, the Symphony of Lights from the best vantage point. a must visit tourist attractions. How do we go about sight-seeing from Tsim Sha Tsui?We reach Hong Kong at 8.30 in the morn are going to stay in Tsim Sha Tsuiarea. How do we go around ... (india). Here's the easiest and most efficient way on how to get there making the most of your time. Hong Kong International Airport (HKIA) ==> Mongkok ==> Hong Kong Avenue of Stars. Go to the Airport (Ground Transportation Centre) Cityflyer and get on the Airbus A21, about 45 minutes bus ride to Mongkok @ HK$33. Get-off at Nathan road Bus stop (6th bus stop) 688 Nathan Road outside Argyle Centre near Mong Kok Station (Exit B1). Take a few steps walk through Sai Yeung Choi Street South, Tung Choi Street (Ladies' Market), Fa Yuen Street. The famed, open-air Ladies' Market in Tung Choi Street is a perfect place to shop for inexpensive clothing, accessories, electronic games, toys and great souvenirs. It's open 12:00 noon until 9:30 pm, daily. Also, Sai Yueng Choi Street South has a fantastic shops with the latest Audio-Visual and telecommunication products and it is open 10:00 am until midnight, daily. When shopping is done, look for Mongkok MTR station nearby and take the MTR trains Tsuen Wan Line towards Central then get-off at Tsim Sha Tsui station and take Exit F. Follow directions towards the Tsim Sha Tsui Promenade where the Avenue of Stars is located. Actually, you can go straight to the Avenue of Stars with same bus above (CTB A21) and get off at 15th bus stop located at Salisbury Road opposite New World Centre before Catham Road South then a few minutes walk to the TST promenade. Take the Airport Express train from Airport station and get off at Kowloon station (21 minutes @ HK$90) and then take the FREE Airport Express Shuttle bus route K2 from Kowloon station and get off at East Tsim Sha Tsui station. Take a short walk to the TST promenade. Route #3, from Shenzhen Lo-Wu border: If you are coming from Shenzhen, China and you pass thru Lo Wu immigration and then wanted to go directly to Hong Kong Avenue of Stars. After exit from Hong Kong Immigration at Lo Wu border, take the MTR East Rail Line train (please read train safety tips here) and get off at Hung Hom station. Interchange trains to the West Rail Line and get off at East Tsim Sha Tsui station and then take Exit J. Total train travel time is 47 minutes @ HK$34.8. Upon exit, follow directional signs towards the Tsim Sha Tsui promenade and Avenue of Stars in Hong Kong. 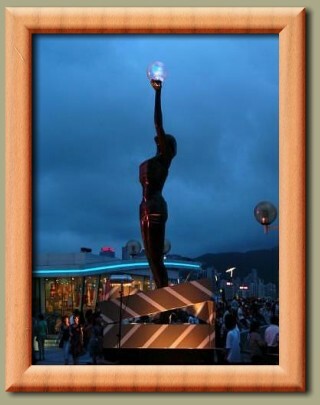 Please click here to read more related topics about getting to Hong Kong Avenue of Stars specially if coming from Central, Hong Kong island.